I have a player who strapped himself down with 2x 60 round Heavy Bolter box magazines and about 30+ frag and krak grenades. This is in addition to his backpack fed heavy bolter (Godfeckindamn autocorrect) and other standard issue gear. How do ya'll deal with this type of scenario? I'm not sure how the grenades and bolt rounds actually work. But if they're very similar to modern day munitions, and they do seem rather primitive by comparison to force fields and lasguns, I imagine there's a danger of a cook-off if subjected to extreme force or heat. Certainly, taking critical damage might impede the function of a backpack ammo supply, the belt doesn't spool out anymore, that sort of thing. What else? What rules would be appropriate to create or apply in this scenario? Don't make new rules, just talk with your player about your concerns and come to an equitable solution. I'd say grenades probably cook off. Not sure about what bolts are made of on the inside (the Core illustrations are not helping too much, but it's surely included somewhere in GW 'dexes or other background material - Lynata can probably tell), but the likelihood of weapon jams are almost certain as the metal deforms under heat, making some - or all - bullets unusable. Actually the same thing happened in my games too. What I did was asking the player to describe exactly how and where he carries a few dozen grenades around, then warned him of the possible consequences, especially a cook-off. And of course, you can do the mature thing, as suggested above. Explosive ammunition certainly comes with a bit of a risk to "prematurely detonate under certain battlefield situations", but then again, this risk would exist for all the other players as well, if only in a diminished fashion as they are carrying sensible loads. With the ridiculous amount of grenades that one guy is carrying, though, I'd say something very simple would be understandable. For example, if an enemy attack with an Energy or Explosive weapon ever rolls a 9 on their damage die, the grenades go off a la domino effect. Roll the grenade's profile damage once, subtract AP and TB, then multiply the remaining damage with the amount of grenades he still had on his person. If he's lucky and the damage does not force him to burn a Fate Point to escape death, lower the AP of his armour by 2 on all locations to represent the damage. However, this might not even be necessary. You could as well appeal to common sense and ask this player just how he is actually storing all this gear. With the rulebook's broken Carrying Capacity rules, it might work out strengthwise, but just how is he actually keeping all this equipment on his body? You can't really attach one backpack to another, and he only has one back. Likewise, those grenades must be stored somewhere. Then let the players mix and match as they see fit. Astartes simply have the advantage of basically being able to disregard weight as an additional factor. It's not impossible to carry this stuff around - for example, my player fashioned a pouch from some cloth, tying it around his torso like a baby sling -, the thing to be stressed is how it makes the Marine horribly exposed. If you cover your armour almost completely with powerful (anti-armour) explosives anywhere, that sort of defeats the point of being armoured. The five-hand rule is a good starting point. I never used it myself, but it seems to work for a lot of GMs here. There are also other rules-legal and sensible options available if someone absolutely can't do without enough explosives and reloads to level a smaller hive city, mostly in the form of vehicles and followers. One can buy a serf or servitor permanently for a bit over 500 XP to act as The Luggage (although avoid using The Luggage itself; it has altogether too many legs. Bit of a Chaos vibe, if I you don't mind me saying so). There is an astartes something kit in the rites of battle (i think) wargear, which has pouches and stuff to carry stuff around. I like to force players hording ridicculous amounts of ammunition to take that as well.. I think what I'll do is impose something similar to Lynata's system if they exceed their tactical load out. If they're carrying roughly what they should be carrying, no issue. For ease of mathing and brutality's sake, for each individual item they carry, a damage die roll from 10 on down will also strike the munition. Depending on the kind of damage, it will affect the equipment appropriately. X has an extra magazine above his standard issue. On a damage die roll of 10, that magazine was struck in addition to himself. The effect of the magazine being struck depends on the damage type he is struck by. If it is rending or impact, the magazine is basically unusable. Half the rounds are shredded or bent, the magazine itself is sheared and will not feed into the bolter's well. If it is explosive or energy based attack that strikes the magazine, the rounds detonate. Due to proximity, he takes 50% of the rounds in the magazine to that location. In other words, shoots himself 12 times in the chest due to bad luck and lack of foresight. For each additional item, the chance of equipment being struck increases similarly. Two items = a damage die roll of 9 or 10. Ten items = 100% chance of a piece of equipment being struck when successfully attacked. Of course, depends on location, etc. So if he strapped all of his grenades and ammo to his chest, it'd only be an issue if he's struck on the chest when checking for random hit location. I don't want to deal with facing, random tables, and the like. I need a quick, clean, and clearly understandable system that matches the potential gains of carrying quintuple munitions with an appropriate level of risk. If it is explosive or energy based attack that strikes the magazine, the rounds detonate. Due to proximity, he takes 50% of the rounds in the magazine to that location. In other words, shoots himself 12 times in the chest due to bad luck and lack of foresight. You can probably ignore this at least for bolter rounds -- given that the rounds are not "at speed" they would have little Penetration and would detonate outside the armour, projecting the majority of the explosion's kinetic force away from the Marine. With the armour's thickness and insane Toughness Bonus, there would be no effect to the wearer. However, if you really want to, you could use this as a justification to lower the armour location's AP by 1. Maybe that's enough of a wake-up call already: not too punishing, but bad enough to rethink the loadout on future deployments. Just don't go immediately nuclear with the punishment - but you're an old RPG hand, you know that already. Give them a bit of a scare first, to see what they do - you can drop plenty of pianos on them later. Well, my guys are pretty good about that. Fairly certain that once I roll a system out to deal with it, they'll react appropriately. Right now, there's nothing in the book that covers the topic, that's why they did it. Their calculus will change once a risk is implemented. It'll be fair, they'll share the same risk of equipment vulnerability as the enemies. They don't care that it's brutal, they'll care that the effects are applied to the enemies too. I have the weirdest images in my mind right now. 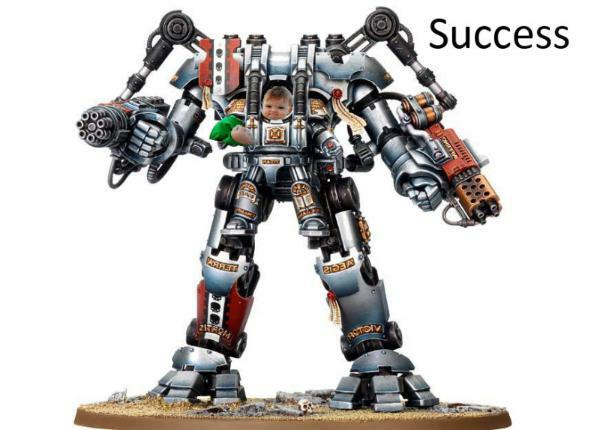 Oh, and flashbacks to the GK Dreadknight. I was picturing the ammo backpack mounted on the front just like the back, giving that bulbous rounded look to our intrepid PC characters. "Help, I've fallen and I can't get up!" Also works great for absorbing incoming enemy fire! What could possibly go wrong? To riff off your joke, I'd say there's a 100% chance that any damage to the torso will hit his ammo supply. "Oh look, these guys are all carrying flamers!" "Bad news: all your ammo cooked of and you blew up." "But the good news is all those bullets and shrapnel flying around killed the guy who flamed you..."
"... and half of your team mates." Eh ... on the one hand, yes, on the other ... I kind of fully expect that bolters (at least) and perhaps also astartes grenades would be employing explosive materials that are highly stable and resistant to accidental detonation. Certainly flamer/incendiary and plasma munitions would be more vulnerable (but I'd also expect them to be stored in robust units). I mean, sure, the more exotic stuff is probably less stable, but normal bolter ammo? that should be pretty stable and resistant to accidental detonation or cookoff assuming it's been stored properly. I'd figure that you might have the more vulnerable stuff at risk of going off from Energy or Explosive critical damage to the right area or a Righteous Fury/equivalent. But: Have it happen to an enemy before you do it to players and describe what happened. Also, isn't there nominally a degree of semi-protected storage space inside the armor? As opposed to regular grenades? Depends on source and author interpretation, most likely. Judging from the ancient yet only cross-section that the GW core studio has ever produced themselves, what space there is, is occupied by various gadgets that are part of the suit, and their own reserved storage -- such as nutrients and drugs. It's probably a bit of an in-universe design flaw, for if whoever designed these suits had made the upper legs as thick as the lower section, they could have added something like Robocop's extending thigh holster for ammo clips. But as it is, the image suggests that ammunition is stored in hardcase pouches attached to the armour, with the lower half of the magazine exposed to allow easy access for fast reloads. That's how I explain the discrepancies in profiles between "Astartes" and "non-Astartes/civilian" weapons - the "Astartes" ones are using somewhat fancier materials than the non-Astartes versions <insert relevant Imperial/AdMech idiosyncracies to justify this bit of madness>. But yes ... it's not exactly the most reasonable thing there is. Also them being bigger, you can just fit more explosive material in something the size of a pineapple than something the size of an apple.